I debated shopping on Black Friday. Heck, I debated going out on Thanksgiving. But then I thought hard about it and changed my mind. 1. It's rainy. And cold. As in 30 degree temperatures cold. No thanks. Also, the people of Oklahoma can barely drive in normal weather. Add rain and it's a complete clustercrap. I don't want to risk getting hit. 2. I preferred my sleep. It's true. Although I did wake up at 2 AM to shop the Walmart Black Friday sale online. But then I climbed right back in bed when I was done. I didn't have to put on real pants. 3. Rude shoppers irritate me. I always try to be polite. But other people don't always follow this rule. I didn't feel like being shoved or jostled. Especially if the shopper forgot to put on deodorant. 4. I didn't want to search for a parking spot. The people of Oklahoma also are terrible parkers. Sometimes they'll take up two spots so this means parking can be tricky. So I'd be out in the cold, in the rain, half asleep, and circling the parking lot. No thanks. 5. I would have been PISSED if the deal I went out for was gone. Waking up in the cold? Searching for a parking spot? FOR NOTHING? I'd have cursed up a storm. 6. I judge parents who bring tiny children out with them. I mean. I get you want to shop. But don't bring out Junior when Junior clearly wants to sleep. Then we have to listen to Junior whine and cry, and nerves are already on edge because of the weather, the waking up early, and all the lines. 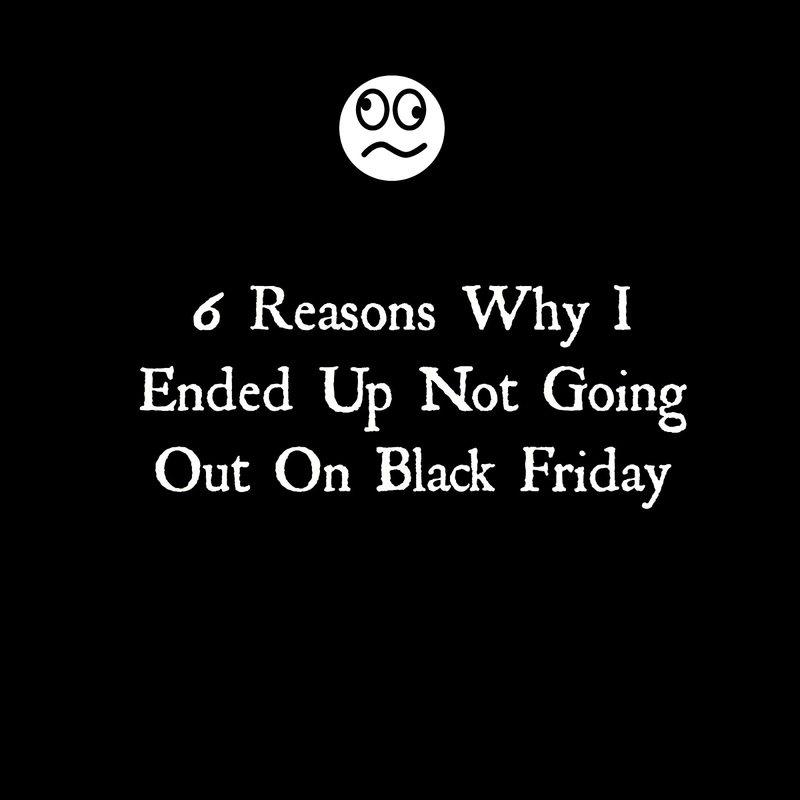 Did YOU go out on Black Friday? Or did you shop online? I don't go Black Friday shopping and I definitely wouldn't do Thanksgiving shopping. I wish stores would just have the deals, but then stick to their regular hours, so people can enjoy the holiday and their families. I will shop online though and helped my mom upgrade her TV last night! Yay for your new tv!! I was up late too girl!! Amazon top ten deals! I got Military Husband Rock Band for Ps4 for $100. And I never left my bed!! I've only been out for Black Friday once - and it was on a post in Germany at their huge, brand new, giant PX/BX. We bought our TV....still using it here in America 7 years later so I guess the deal was a good one! I think it was like 30% off or something, though, not one of those huge "$80 for a huge TV!" deals. This one was more like $200. but it's plasma or whatever. Or LED or something. After that experience I know with 100% assurance I will never, ever go black Friday shopping again. Your reasons listed above.....plus deals that are just not that awesome, tbh. Glad you got to chill inside instead! After working retail in college, i refuse to shop on Black Friday. We went out to get a tree and that was it! I do Cyber Monday on occasion. I don't know if I've ever really researched it and figured out that there are great deals. Hence, why I'm bewildered why people go out on Black Friday. I suppose I figure there IS a reason! Even when I lived in the States, I just couldn't fathom the crowds.... Pure insanity!! And I hate shopping when everything is strewn about the store, stresses me out...! Online is definitely the way to do it! I went out for the first time ever... for baby clothes. They were on crazy sale at a local GROCERY STORE... so it was just like any other day... not busy at all! No one else was in the section, so I got to take my time choosing, AND I didn't have to wait for a single person at the self checkout! 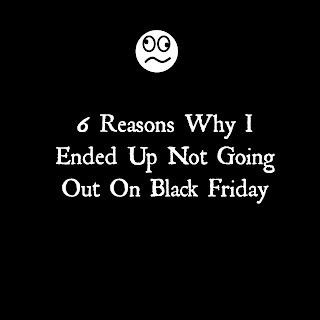 :) I would never go to Walmart or any of the crazy crowded stores on Black Friday, though.